This workshop will help to get you comfortable with the process of painting with very simple and easy to understand demos and lectures. 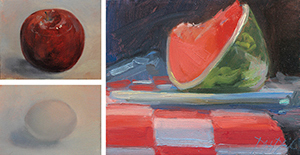 The class includes interesting and memorable discussions on all the basic elements of painting including, composition, massing, building form, light and shadow, and depending on your own style, knowing when a work is finished (learning how to not overwork your painting). 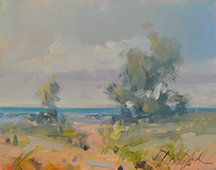 Douglas delivers sound principles of painting that are an incredible foundation for your painting, and whether a person who has never ever picked up a brush, a relatively new painter or a more accomplished painter looking for some strong basic foundation principles and points to review, it will make sense. Last hour: In the last hour, after cleaning up, review of your 3 days of work ends workshop on a very high note.